How does one make rough measurements of water quality or purity in a primitive environment? We talked about making a number of different types of water distillers. But then how does one measure how good the result is? Taste it is one simple test, but how about coming up with a more objective approach. The challenge then is to put together a meter from commonly available parts that will do a reasonably well job of measuring in relative terms water purity with distilled being the top of the scale. The first thought is to measure water resistance with a digital volt-ohm meter. One would take and connect the Volt-Ohm meter directly across two electrodes of the same type of metal. Put this in solution and read the resistances from the meter. After doing some careful testing with several types of electrodes I came to the following conclusion. This is not the way to go. It is way too many variables and the reading are all over the place. You take a measurement on one scale and it is totally different on another scale of the same meter. Distilled water measures close to the same resistance as tap water with sometime only twice the reading some times 8 times the reading. Next time you come back for a reading it is total different. The longer it is connected the more it drifts to higher resistance. To make matters worse if one then interchanges the clip leads and tests again one finds a negative resistance that goes to zero and starts climbing. This means the electrodes are acting like a battery and being charged up. Both electrodes were made from the same type metal. The main problem is the voltage that the meter supplies is variable and very low when compared to electronegative of the metals used. So with lessons learned I found that if one uses a 4-cell AA battery pack producing between 5 and 6 volts and a current meter in series with the electrodes that workable measurements can be done. Actually I think anything over about 3-4 volts to 12 volts DC would also work. 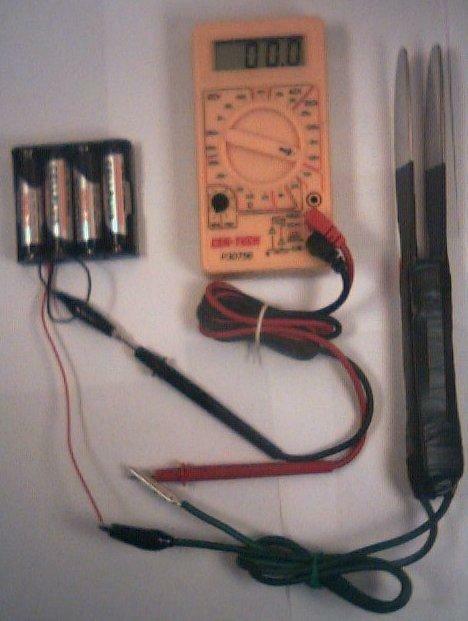 The battery and the current meter (digital Volt-Ohm meter used on the current scale) and the electrodes are all wired in series. As you can see in the picture I finally found a good use for Stainless Steel butter knifes. One puts a strip of molding 3/8 thick wood molding between two SS butter knifes and then wraps electrical tape around the handle. The bare wires are taped to the outside of the handles making contact by pressure from the tape. The full length of the handle is taped so that the conductivity of the hand holding the electrodes does not interferer with the readings. The upper half of the knife blades are taped so that when one puts it into solution up to the back tape the same amount of surface area will be exposed to the water. Surface area is proportional to current flow. The more the surface area, the more the current flow. Typical measurements give a current of about 15 to 20 ma for tap water where I live with store bought distilled water at less than .1 ma. The measurements made from this approach are relative to your local input water, with the lower the ma the better the water. By use of this meter one can tune up ones filtering or distillation processes to minimize current flow and maximize water purity. This approach measure the conductive ions and may be misleading when used with some types of filtering but in general the lower the current the better the water. The digital meter was purchased from Harbor Fright tools for less than $10. See ITEM 90899-2VGA for $4.99 and ITEM 30756-3VGA for $9.99. The battery case was purchased from radio shack. The stainless steel butter knifes have been setting in my kitchen drawer awaiting a good use.